Another of those damned Horus Heresy books. Magnus the Red is loyal to the Emperor, but he and his legion, The Thousand Sons, are known to use witchcraft in their battles. The other legions distrust them for this of course, despite the fact that it’s Horus who’s gone loopy. Anyway, Magnus has a vision showing Horus’ treachery and warps over to Earth to snitch. Unfortunately, Magnus lands on an expensive and rare piece of kit the Emperor had been working on for ages and is displeased. In retaliation, the big cheese sends the Space Wolves to the Thousand Sons’ planet to break his tele and slaughter the population. If we ignore the first third of the novel, which is unneeded, it’s actually not bad. It’s well written, has some good set pieces and is atmospheric. The battle at the end is huge and well told, and up to spec for this kind of novel. I’m not sure exactly where it fits with the other books in the series, we seem to have gone back a few decades. As I’ve said before, the HH series ran out of steam long ago. Although this one is probably more worth reading than most. 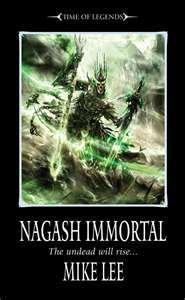 A Thousand Sons, Graham McNeill, The Black Library, £7.99.